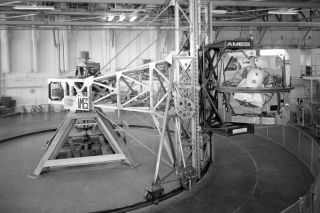 The Ames 5 degrees-of-freedom motion simulator, shown here in June 6, 1962, allowed testing for multiple angular motions. In this historical photo from the U.S. space agency, the NASA Ames 5 degrees-of-freedom motion simulator is shown on June 6, 1962. This simulator incorporated a centrifuge with a 30 foot spin radius. The simulated cockpit located within the hooded cab at the end of the centrifuge arm was driven by motors as required by the simulation about each of its three axes (pitch, roll, and yaw). The cab was also driven through a limited range of motion along the vertical axis and of course was driven by the centrifuge arm along a curved path of fixed radius in the horizontal plane. Thus the motions that could be simulated in the cab were three angular motions, one translational motion, and a curvilinear combination of the remaining two translational motions. The curvilinear motions and associated accelerations were of course, fairly representative of airplane flight. The simulator was placed in operation early in 1961.